Definition: The elastic limit is the maximum flexibility your compression spring is able to achieve without taking a permanent set. Based on theory, one would think that every spring compression spring would be able to travel or compress down to its solid height. This statement is false. In this article, you will learn that your compression spring has a limit to how flexible it will be considering its physical dimensions. When a compression spring has a good amount of pitch in between the coils in proportion with the free length and its coils aren’t too tight, there is a chance that your coil spring might be able to safely deflect to its solid height. On the other hand, if you have a lot of pitch in between the coils in proportion with the free length and/or a tight index, your spring is under more stress. This means that it’ll be stronger but there will be a compression spring elastic limit which might not allow it to travel down to its solid height. Exceeding the elastic limit may result in your spring taking a permanent set which means that it will not return to its free or pre-loaded length once the load is released. The softness of the material type you use also has a lot to do with the compression spring elastic limit. 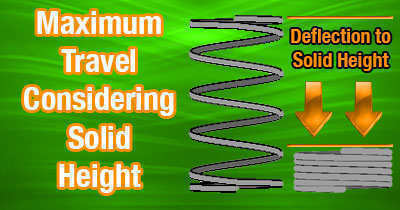 Using our online compression spring elastic limit spring calculator, you will see that there are two safe travel values that can help you in bettering your design. These are true maximum travel and maximum travel considering solid height. The maximum travel considering solid height is the actual compression spring elastic limit which you are getting out of your recent design. There are cases in which this value will allow you to safely compress your spring to solid height; although making a compression spring travel down to solid height isn’t very recommendable due to the impact the coils will undergo when they all begin to touch. 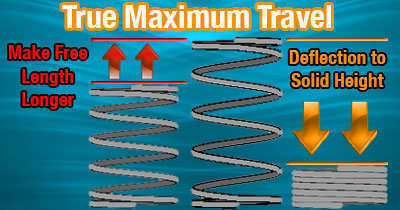 The true maximum travel shows you the real compression spring elastic limit based on the spring dimensions of your compression spring design. 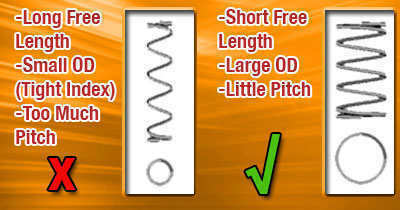 It basically tells you that you can get more travel out of a spring design if you were to make the free length longer. This is because your spring design has very little pitch in between the coils which allows you to add more pitch in between the coils by making the free length longer. To know how much you’re able to extend the free length, subtract the maximum travel considering solid height from the true maximum travel and then add a value less than or equal to the result. If the true maximum travel and the maximum travel considering solid height are the same, it means that you’re either at the limit of making your free length longer or it is too long to travel down to solid height. Confirm this assumption by subtracting the compression spring elastic limit (maximum travel considering solid height) from the free length and see if it matches the solid height. If it’s a higher value than the solid height, the compression spring will not be able to be fully compressed.